Child development is key during the toddler years, we encourage your child to develop and grow utilizing age appropriate practices. 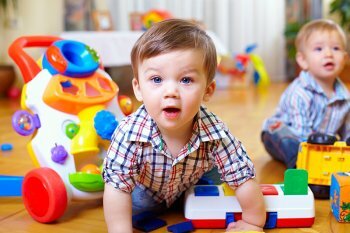 We have more than three decades of child care experience and are committed to your child’s Health, Safety and Happiness. Our teachers have completed college courses and are knowledgeable in the stages of infant development. Children at this age have a natural curiosity and caregivers encourage exploration of their world. Their day is filled with language and sensory activities appropriate to their age, as well as the nurturing that is so vital at this age. We conduct quarterly reviews with parents to update their child’s needs and schedule. We only use diapers, bedding, clothing, food, and wipes provided by each child’s parents. Toddlers are kept separate from older kids and are cared for by our attentive, caring teachers. Please contact our Huntington Beach child care facility at (714) 377-0533 to schedule a tour or if you would like to learn more about our toddler program!